Fountain Valley, Huntington Beach, Orange County Cosmetic Dentistry – Andrew G. Mortensen, D.D.S. Hear from satisfied patients and see the results for yourself. Welcome to the office of Andrew G. Mortensen, D.D.S! Dr. Mortensen has proudly served Costa Mesa, Huntington Beach, Fountain Valley, and all of Orange County for many years. Here, we emphasize cosmetic dentistry and are dedicated to designing dazzling, healthy smiles for our patients. We combine state-of-the-art technology, modern materials, and dental expertise to improve your smile easily, comfortably, and, often, permanently. You'll be amazed at what we can do. Whether you are in need of a subtle change or a full mouth makeover, Dr. Mortensen has a solution. Contact us today to schedule a consultation! As a Las Vegas Institute-trained dentist with an accreditation from the American Academy of Cosmetic Dentistry, you can trust Dr. Mortensen to provide superlative care and beautiful results. With more than 30 years of experience to call upon, he can handle any dental need. A talented and skilled cosmetic dentist, Dr. Andrew G. Mortensen has been creating beautiful smiles for patients in Fountain Valley, Huntington Beach, and all of Orange County for years. He specializes in a full spectrum of cosmetic dentistry procedures, including porcelain veneers, teeth whitening, and dental bonding that can restore not only your smile but also your confidence. We are proud to also offer dental implants, sedation dentistry, and a full array of general dentistry procedures. Dr. Mortensen is an accredited member of the American Academy of Cosmetic Dentistry. We believe our combination of skills, amenities, and expertise lets us provide a great level of patient care. Whatever your dental needs, we can help. Come see why we are Huntington Beach and Fountain Valley's favorite source for cosmetic dentistry. Contact our office in Orange County today for a cosmetic dentistry consultation or to schedule a general dental appointment. Here on our website, Orange County residents can get acquainted with all the exciting features of our office. Read about the wide array of cosmetic dentistry procedures we offer, including porcelain veneers, teeth whitening, and dental implants. We are happy to be able to calm our patients' fears of going to the dentist and provide the full range of general and cosmetic dentistry procedures painlessly, using sedation dentistry techniques. In addition, our Fountain Valley office near Huntington Beach features all the latest general and cosmetic dentistry technology that makes visits to the dentist easier and more relaxing – whether you simply need a set of X-rays or a full mouth restoration. 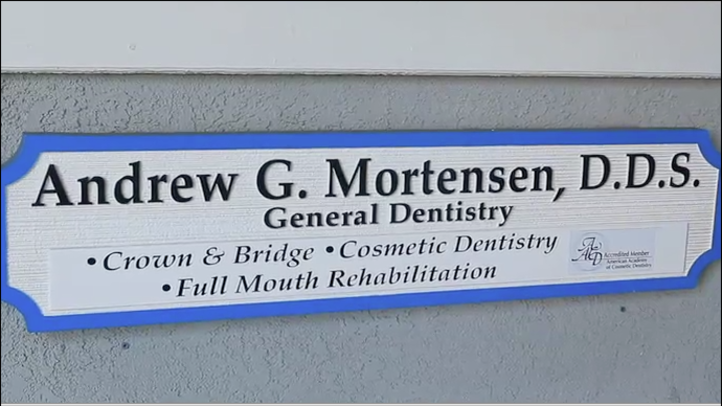 Serving Fountain Valley, Huntington Beach, and all of Orange County, Dr. Andrew Mortensen's cosmetic dentistry practice is a premier source for cosmetic, implant, sedation and general dentistry. Contact us today to schedule a consultation or appointment.